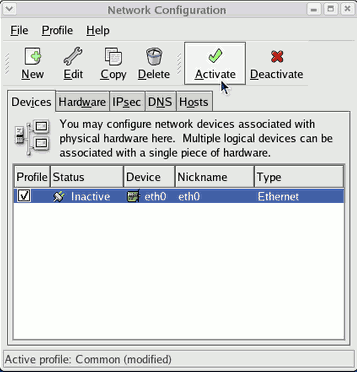 Once the para-virtualized network driver is loaded you may need to reconfigure the guest's network interface to reflect the driver and virtual Ethernet card change. 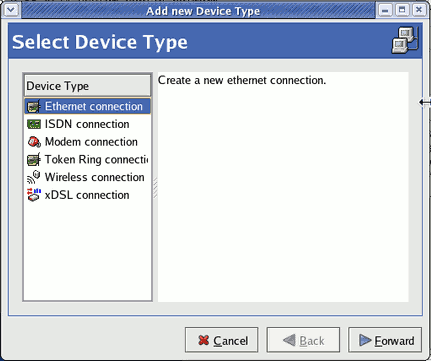 Perform the following steps to reconfigure the network interface inside the guest. In virt-manager open the console window for the guest and log in as root. On Red Hat Enterprise Linux 4 verify the file /etc/modprobe.conf contains the line “alias eth0 xen-vnif”. To display the present settings for eth0 execute “# ifconfig eth0”. If you receive an error about the device not existing you should load the modules manually as outlined in Section 37.4, “Manually loading the para-virtualized drivers”. Start the network configuration utility(NetworkManager) with the command “# system-config-network”. 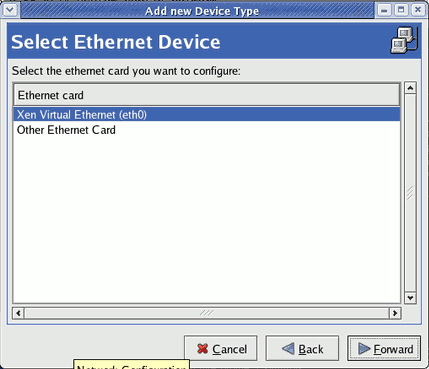 Click on the “Forward” button to start the network card configuration. 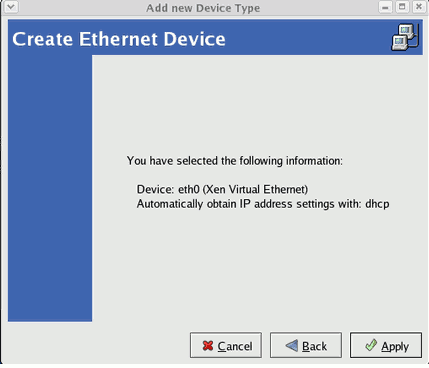 Select the 'Xen Virtual Ethernet Card (eth0)' entry and click 'Forward'. 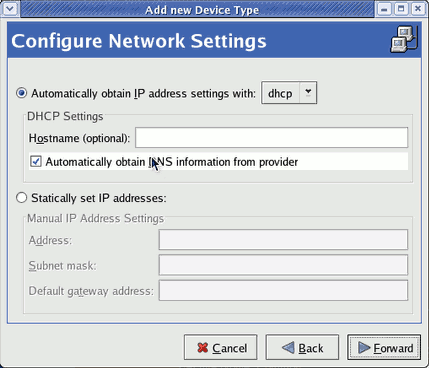 Configure the network settings as required. Complete the configuration by pressing the 'Apply' button. Press the 'Activate' button to apply the new settings and restart the network. You should now see the new network interface with an IP address assigned.